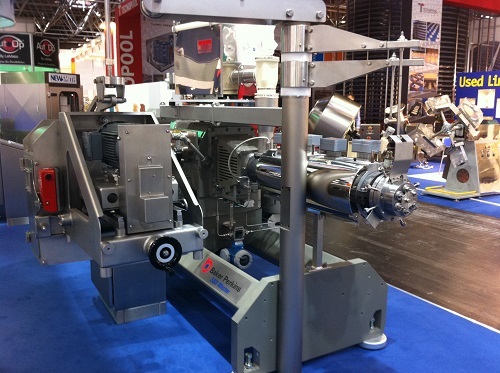 Three new enhancements to the Baker Perkins Snack Master™ extrusion system were highlighted at Interpack 2011 (Hall 4 Stand C17). Also exhibited was a healthy new way of processing snack pellets. The Snack Master™ system comprises the versatile SBX Master™ extruder and a range of post-extrusion forming equipment. The range is represented on the Interpack stand by an SBX Master™ extruder with a co-extrusion die, a coathanger die, and a pillow crimper. The three new additions to the range are forming options that demonstrate the system’s ability to make a wide range of different snacks, from direct expanded types through to higher added-value products with sophisticated taste and texture combinations. The first is a new adjustable face cutter for direct expanded products that offers easy blade changes in 15 minutes, without stopping production, plus fine adjustment of the cutter blade to enable the optimum position for clean cutting and minimum blade wear to be quickly achieved. To avoid smearing of product on the die face the cutter blade is moved into position axially rather than across the face. Die changes and cleaning are made very easy by mounting the extruder die and face cutter on swing arms that enable them to be moved in and out of position quickly and safely. The second new addition is a process for making a completely new range of extruded products using an innovative die that produces a thin, wide sheet of dough that is cut into regular, geometric shapes by an in-line rotary cutter. The shapes may be fried as a conventional snack, or oven baked for snacks with lower fat contents. The die may be supplied as part of a new snack extrusion system or retrofitted to an existing line. The final enhancement is a pillow crimper for the CoEx Master™ co-extrusion range. Co-extrusion systems incorporate fillings with contrasting textures and colours into a cereal outer to create high added-value products.. The pillow crimper forms filled tubes from the extruder into individual pillows, tubes, bars or wafers. A new process highlighted at Interpack is continuous puffing of pellet snacks using hot air. Based on the proven Thermoglide2™ Toaster the new snack puffing system replaces frying as a means of converting pellets into a finished snack. No oil is absorbed during the expansion process, unlike frying, and only the minimum amounts required for flavour need be added afterwards. Flexibility is at the heart of the Baker Perkins Snack Master™ expandable line concept. This approach to plant design enables a standard Snack Master™ line used to make direct expanded products such as corn curls, chipsticks, and maize rings, to be extended in stages to produce a wider range of added-value products, including whole grain / multigrain and sweet or savoury filled pillows. Baker Perkins works with customers to develop new product ideas and provides the process expertise to reconfigure the lines to manufacture them.